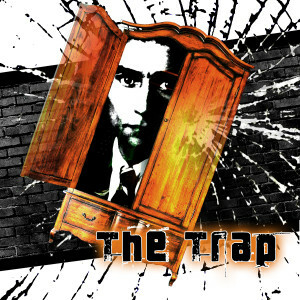 In “The Trap”, Tadeusz Różewicz has a dying Franz Kafka deliriously dream of a world of horrors that could have come from a novel Kafka never had a chance to write, but that would become reality in Prague and Vienna and across Europe less than two decades after the author’s death. The man who wrote of the nightmare of Josef K. in “The Trial” would not have been surprised by the rise of a regime that perfected brutality through bureaucracy, and that mobilized a continent to mechanize murder on an unprecedented scale. K.’s arrest on charges he is never made aware of, the alternating stupidity and pomposity of the officers of the court, and a system where the law could change from moment to moment at whim of the masters — all of these aspects of the story Kafka created would be borne out under Nazism. Throughout “The Trap”, executioners skulk about the edges of the stage, eyeing the movements of the characters with suspicion and disdain. Are they from the near future of the Holocaust, or from Franz’s own time? They are both, and neither; they are the representation of the idea that anyone can become an instrument of death, and that too many among us will stand by while it happens. In one of the most surreal tableaus of the play, a petit bourgeois barber bends Franz’s ear with pretentious babble while in another time, his dim-witted assistant has risen to power as a thuggish enforcer for the Nazi state, humiliating a man of science and learning before hastening him off to his demise. Why did they, and why do we, stand by? Josef K. — and Franz — would know that it is because distance creates deniability. Most of those culpable for the Holocaust, and for atrocities committed both before and since, were not cramming bodies into rail cars or launching missiles aimed at villages, but were rather the people filling out the paperwork to make it happen — like the forms that would send Franz’s beloved sister Ottla, his truest ally throughout “The Trap”, off to Theresienstadt and later Auschwitz, where she would be killed. They never had to witness the real results of all those papers. The executioners in “The Trap” embody what Hannah Arendt called the banality of evil. They are driven not by fanaticism or sociopathy but by a desire to get ahead and get along, and to take advantage of the chaos of the times to rise in stature. They might be unwilling to kill by the sword, but are all too willing to do it with the pen. Kafka would have understood.